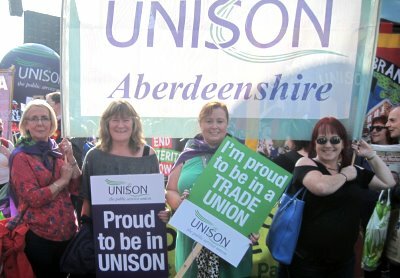 UNISON Aberdeenshire Branch has a new branch website. As Aberdeenshire Council continues to explore the proposal to move its sport, culture and leisure services out to a trust, UNISON continues to be involved in all working groups and project board looking at this option. Here, Branch Secretary, Inez Kirk gives an update on the branch’s work to ensure our members feed into this process. “UNISON has met with our members during a series of meetings during September and the feedback we have received continues to form our negotiating strategy. So far, the Council has agreed to trade union recognition; the others we continue to discuss. 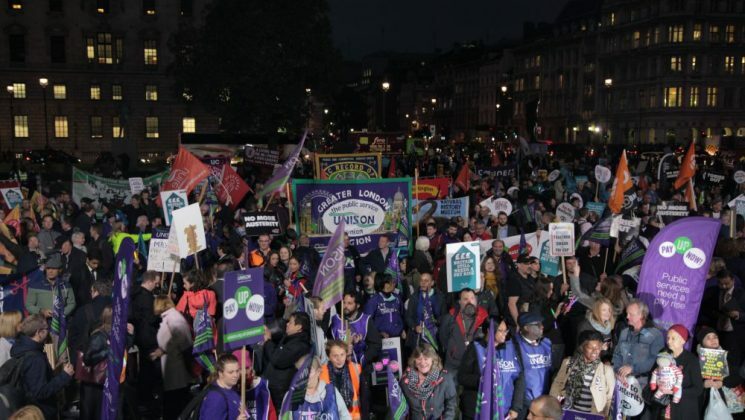 Branch Chair and NEC member Kate Ramsden joined thousands of people from our union and other unions as they came together in London and demanded change, an end to austerity and real pay rises for all public service workers. 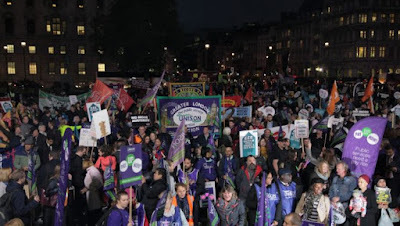 Addressing the rally in Parliament Square, Dave Prentis, UNISON General Secretary told those assembled that this is trade unionism at its best, “United, single-minded and determined to change our country for the better. Branch members joined over 5,000 public service workers as they marched through Edinburgh on 7 October as part of UNISON’s Pay Up Now! Campaign, which is keeping pressure on both the Scottish and Westminster governments to end the pay cap and give all workers a decent pay rise. Public service employees have seen their pay held back right across the UK for almost a decade. Public sector pay rose by just 4.4% between 2010 and 2016, while the cost of living rose by 22%. The rally was addressed by Lilian Macer, UNISON Scotland convener, general secretary Dave Prentis and Gordon McKay, the union’s senior vice president. 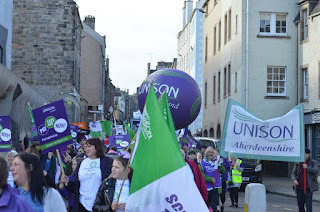 See the full report on the UNISON Scotland website with photos and videos of the event. Pay Up Now! Come along to the March on 7th October and tell the Scottish and UK Governments we need a pay rise now! Following months of UNISON pressure, the Scottish Government has said they will lift the 1% pay cap on public service workers. That’s a welcome start, but what does it mean? 1.2%? 1.7%? 2%? Inflation is 2.9%, so that’s still a real terms pay cut. And what about all the pay we’ve lost over the last 10 years? See just how much you’ve lost with our pay cut calculator www.unison.org.uk/our-campaigns/pay-up-now. And who is it for? The Scottish Government has mentioned nurses and teachers. But what about all the rest of us. Council workers are amongst the lowest paid and local government has taken the biggest hit of job losses. Sign UNISON's Pay Up Now Petition on the UK Parliament website. If our colleagues south of the border win a pay rise then more cash will come to Scotland for ours. It's easy to sign. Please do it now. Council workers, NHS staff, and UNISON members from across the service groups along with their friends and families from all over Scotland, will gather at Holyrood on Saturday 7 October to show we’re serious about getting a proper pay rise. Without you and your fellow workers there, we won't have the strong voice we need. The government will say workers didn’t turn up, so there’s no real demand by staff for a decent pay rise. The fun bit – Coach transport will be free, and there’s going to be free t-shirts, goodie bags for the kids, face painters, children’s entertainers, and 500 free tickets to Dynamic Earth. What’s not to like? Bring your kids, bring your partner, bring your granny, or just bring you! Coaches are free, but you must book in advance. Just call the UNISON Resource Centre on 01224 620624. Spaces are limited, so get in touch by Monday 25 September. Coaches should be back in Aberdeen around 6pm, and after for places further north. We will provide bottled water, but please bring a packed lunch for the day. We will have a collection to raise money for the local CFINE Food Bank (www.cfine.org). UNISON's Pay up Now campaign is calling for an end to the pay restraint imposed by UK and Scottish governments which has affected members in all service groups from the NHS to Local Government to colleges and universities to police staffs and the community and voluntary sector and more. The branch is fully behind the campaign and is calling on all our members to get down to the March and Rally on 7th October in Edinburgh. Buses are running from Aberdeen and you can book your place by calling the UNISON Resource Centre on 01224 620624. Branch Secretary, Inez Kirk said, "For years now all public service workers have seen their pay held back by government in the name of austerity. First a freeze then a cap, resulting in public sector pay, across the UK, rising by just 4.4% between 2010 and 2016 while the cost of living rose by 22%. "That’s no way to treat hardworking people who play such a vital role in looking after us and holding our communities together – keeping us safe, healthy, educated, and cared for." Click here for the UNISON UK calculator and find out what your wages should have been to keep up with inflation. Below is the statement which the branch has sent to all Aberdeenshire councillors as well as to the HR Equalities Team within the council. Aberdeenshire Branch welcomes the council’s new Equalities Outcomes for 2017-21 with their specific focus upon disability, posted last week on Arcadia. The branch commends the council’s Disability Confident accreditation under the Department of Work and Pensions' Disability Confident Scheme. This accreditation recognises the council’s commitment to ensure that people with disabilities and long-term health conditions feel engaged, supported and presented with opportunities to fulfil their potential within the workplace. The branch is committed to doing everything we can to support the council in making this a reality. 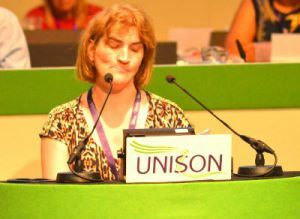 We are also proud that our Equalities Officer, Kathleen Kennedy is a member of the UNISON Scottish disabled members’ self-organised group and has also been active on the national disabled members’ committee and is on the standing orders committee for their conference this year. This reflects very positively on the branch and also on Aberdeenshire Council, as Kathleen can bring her knowledge and experience gained on these groups back to the council. We will be looking for the council’s support for this work.